Business and more? About a year ago we put the predecessor model, the 8460p, to the test. 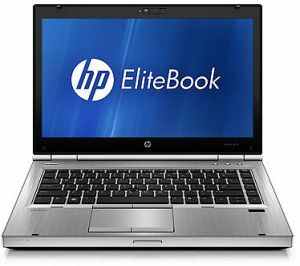 The manufacturer HP now introduces the EliteBook 8470p as the successor, although it has the same old look, the internal components have been revamped. 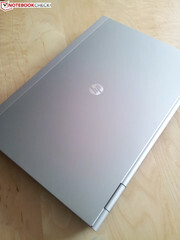 With the EliteBook 8470p HP is trying to build on the success of the previous model, relying on the tried and trusted. And why shouldn't they - as long as the foundations are strong. 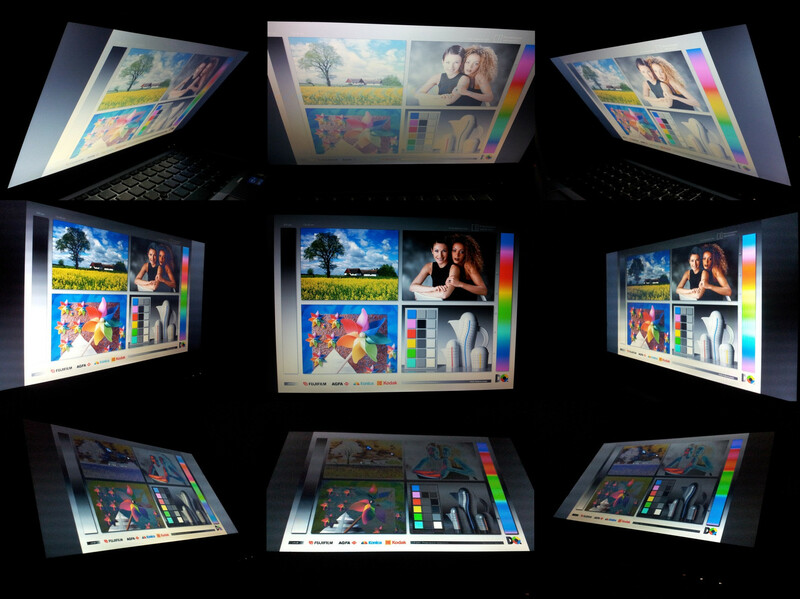 Our test model is well made, very stable and with a 14-inch anti-glare HD display with a diagonal measurement of 35.6 cm. Also, the very pleasant input devices and application performance speak for themselves. However, we don't want to give away everything just yet. The cheapest configuration of the HP 8470p starts at 1349 Euros (~$1746), however, this is a weaker hardware setup than our test model today. According to the manufacturer's website, the EliteBook 8470p comes in a total of 21 configurations and devices with a Core i7 CPU starting at a price of around 1700 Euros (~$2200). Additionally, if you want a 180 GB solid state drive (SSD) instead of the normally installed 500 GB hard drive on board, you better have at least 1800 Euros (~$2329) on hand. In regards to the case, the manufacturer HP hasn't done much work, only dressing the new model up in the robes of its older brother, and why not? After all, the tried and tested case has already proven to be more than convincing when it comes to stability and robustness - and this time it also scores well. So once again we have a very pressure resistant case before us, which doesn't even give up a millimeter when direct pressure is applied. 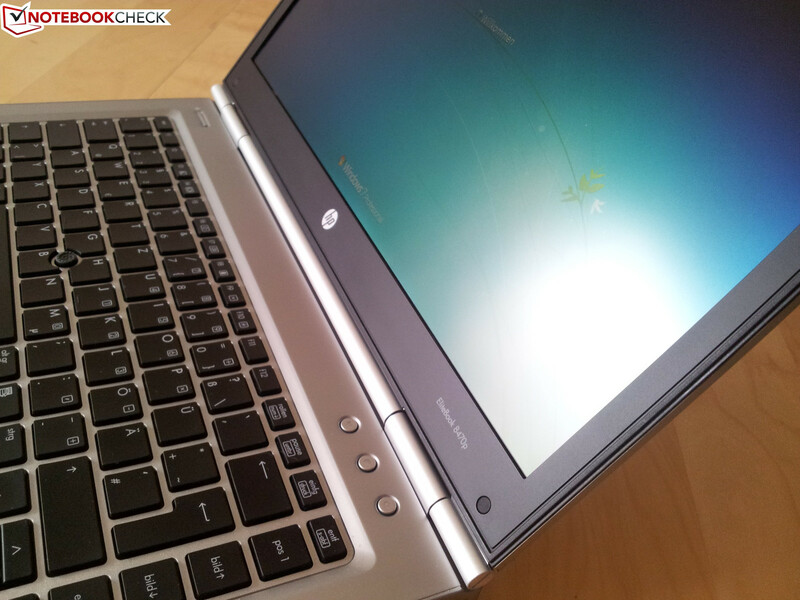 Even the typical weakness of notebooks, the back of the display lid, remains sturdy and doesn't give in. 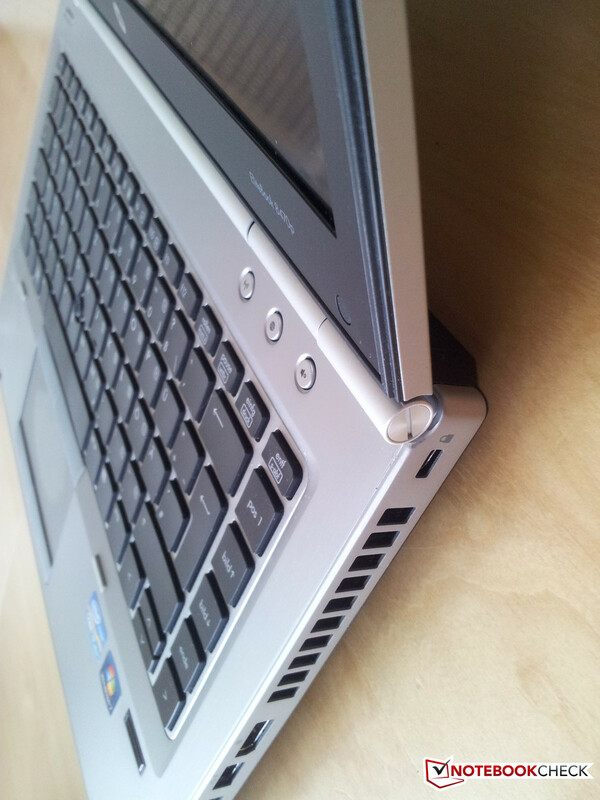 The amazing stability of the case of the EliteBook 8470p is thanks to the materials used (aluminum, magnesium). At the same time as the strong points, we have to consider the weaknesses of the case. So while the business elite is very convincing in terms of workmanship and stability, with measurements of 33.8 cm x 23.1 cm and a thickness of 3.4 cm it does unfortunately have a somewhat chunky appearance. Chic, elegant and handy are therefore words you can't use to describe this business device. The display is held firmly into place without much bounce-back by two hinges, and also has a locking mechanism which prevents accidental opening of the display during transport. The bulky case design brings advantages in terms of ports and HP knows how to use the extra space that is available well. Anyone familiar with the predecessor model EliteBook 8460p will be able to find hardly any updates to the ports. Both the arrangement as well as the ports are identical. Two of the four USB ports run the new USB 3.0 standard. 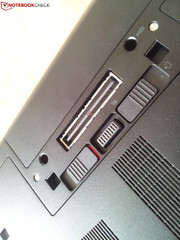 The other two are only available with USB 2.0, one of which acts as an eSATA/USB combination port. 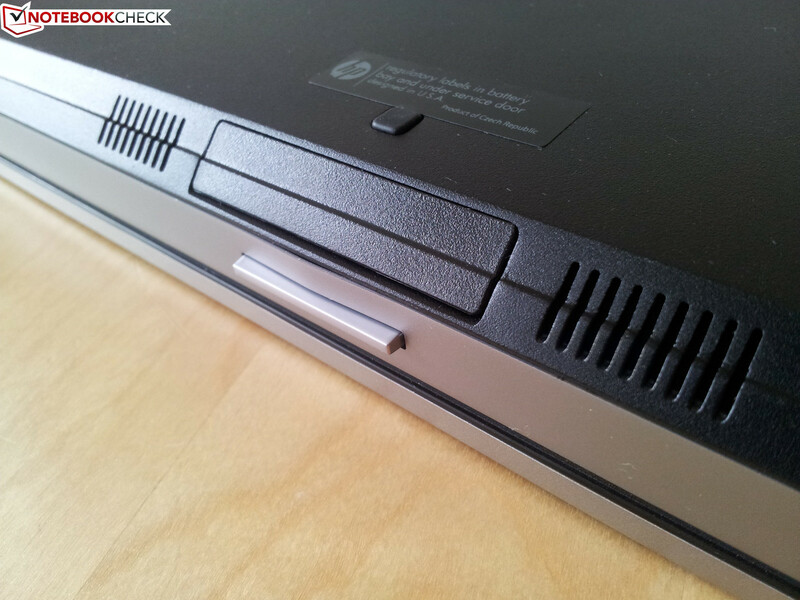 In addition to the standard ports, the EliteBook 8470p has a connection for a docking station and an interface for a second battery on the underside. With the help of this - according to the HP homepage - under optimal conditions the run time can be increased to a total of 36 hours (9-cell main battery + secondary). The ports are mainly found on the left, right and back sides. 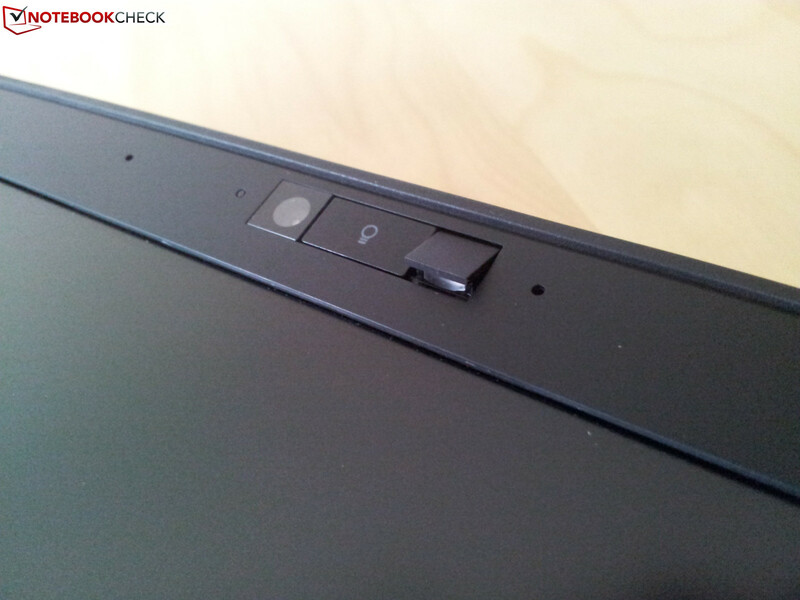 At the front there is only the switch for the display lock and the status LEDs. The layout of the ports is similar to the predecessor and well thought out, especially the placing of the VGA, Ethernet and the RJ-11 modem connections (available for selected models), which are smartly found on the back side, meaning that the left and right sides won't be all cluttered with wires. Luckily, in terms of connectivity HP hasn't held back. 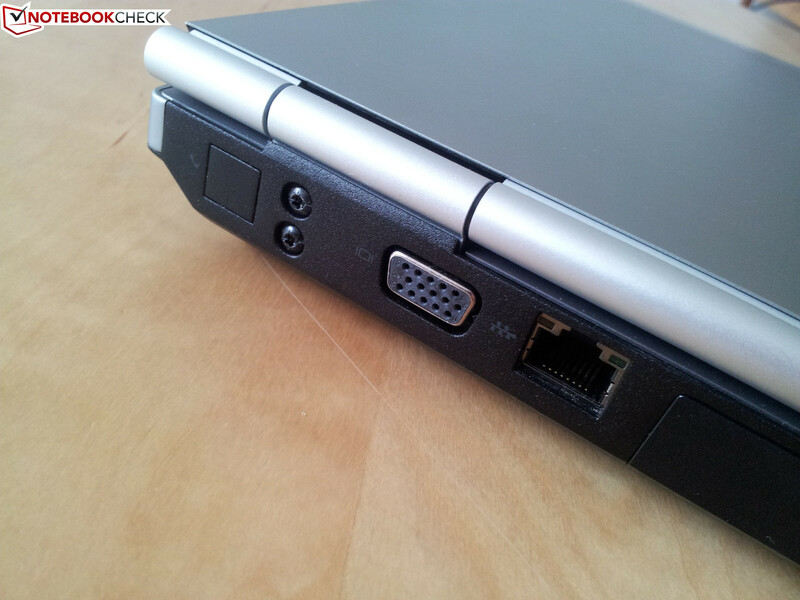 Next to the integrated wired Intel 82579LM Gigabit network connection the EliteBook 8470p also offers Bluetooth 4.0+EDR and a WLAN adapter (Intel Centrino Advanced-N 6205), which uses the standard 802.11a/b/g/n. The WLAN receiver in this test is good in comparison with other devices. Certain devices also contain the option for an internet connection via UMTS. 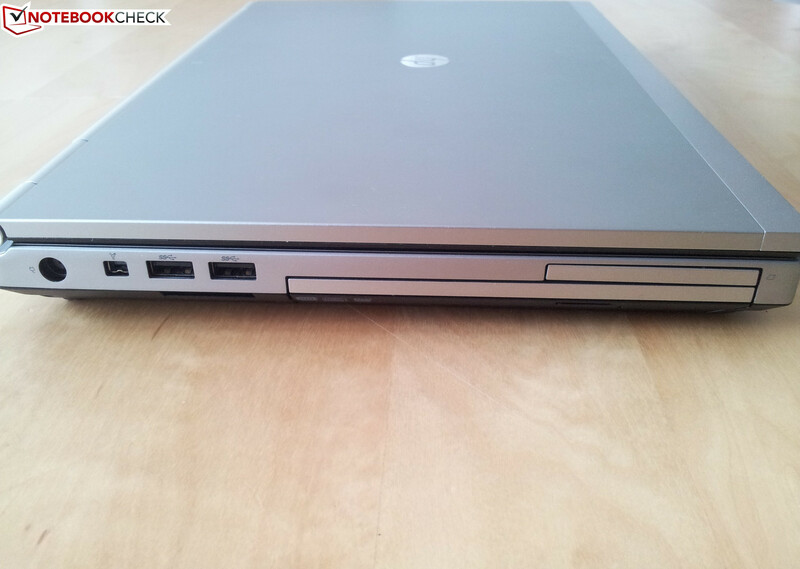 According to the manufacturer, models such as the HP EliteBook 8470p (B6P91EA) have an HP hs2350 HSPA+ mobile broadband adapter installed, which increases the price to 1507 Euro (~$1950). To protect sensitive data from prying eyes HP has given some features to the 8470p business notebook. Next to the usual security measures in the form of a BIOS password or a fingerprint scanner, there is an additional Smartcard reader installed. HP has also thought about security on a software level. For example, we find a security manager on board. HP calls this Protect Tools for short. Here you find tools such as a password manager which manages different passwords from websites. Also free of charge is HP Digital Pass, which should provide additional protection for online accounts. The Credential Manager protects certain programs or websites via a password, fingerprint scan, facial recognition or a PIN entry from unauthorized entry. The loss or theft of a notebook is usually not just associated with a big financial loss. Far more serious consequences can occur when sensitive data falls into the wrong hands. To help prevent this, HP Protect Tools also offers drive encryption, so that the data on the HDD remains unreadable even when switched to another device. Finishing off the range of security features is Computrace (this does however cost), which allows for tracking and managing of the device. In the case that the device is stolen, data can be locked or even deleted remotely, depending on the security set up. 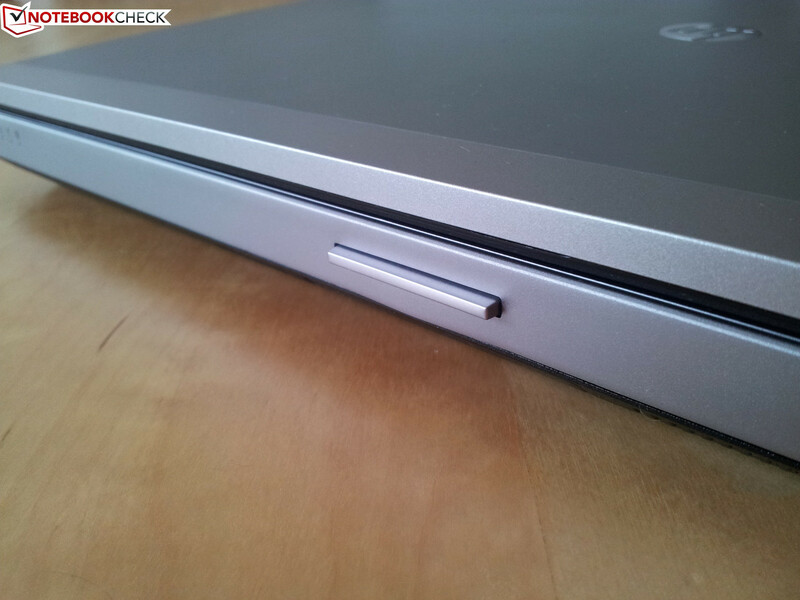 When unpacking the HP EliteBook 8470p there are no special accessories waiting to be found. Two accompanying DVDs contain the Microsoft operating system Windows 7 professional in both 32 bit and 64 bit versions. Just because there aren't any additional accessories in the packaging doesn't mean that there aren't any available. The keyword here is optional accessories, for which you will of course be asked to hand out more cash. So for professional work in the office HP offers a docking station (HP 2012 Advanced Docking Station (120 W) (A7E36AA)) for a confident 271 Euros (~$350), to save you the daily plugging in and unplugging of the peripheral devices. 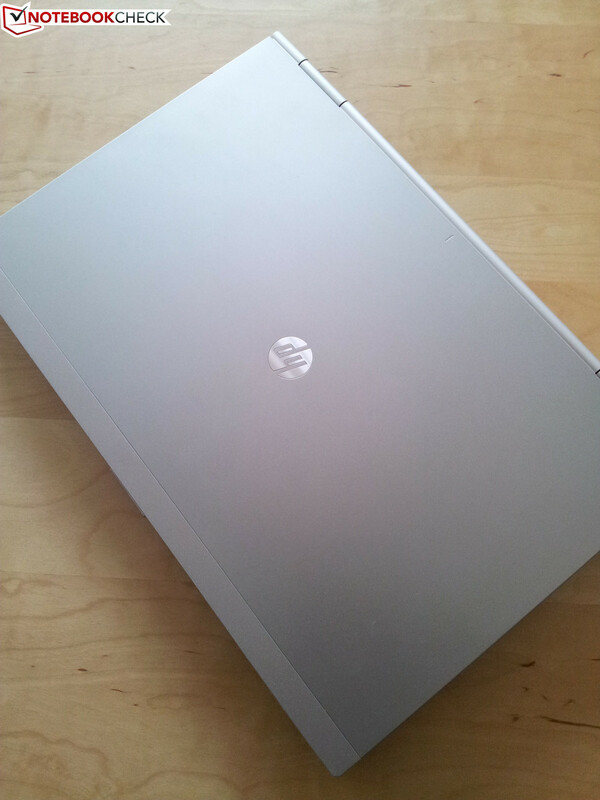 According to the homepage, Hewlett Packard offers a limited warranty of 12 months for the EliteBook 8470p. On-site services as well as other warranty upgrades are also available according to HP, naturally for an additional price. 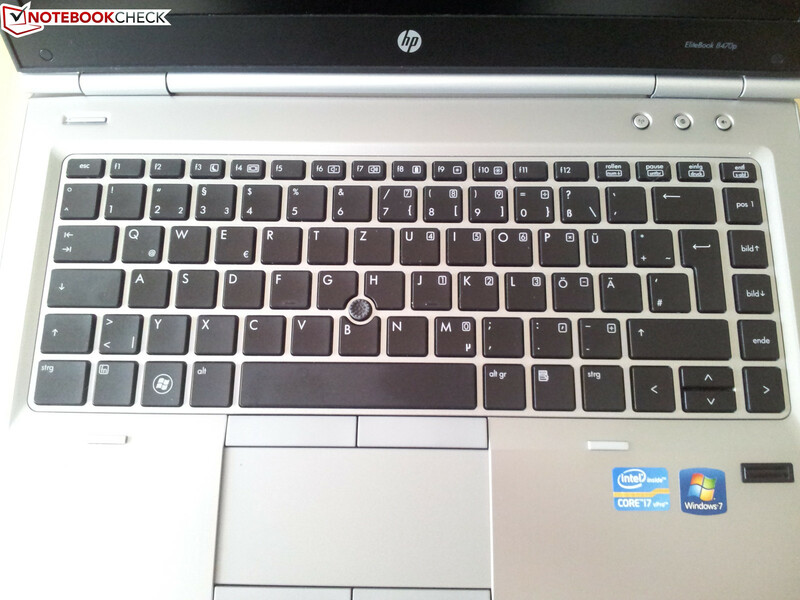 As it should be with a business device, the HP EliteBook 8470p has a very good keyboard with a clear and noticeable pressure point. 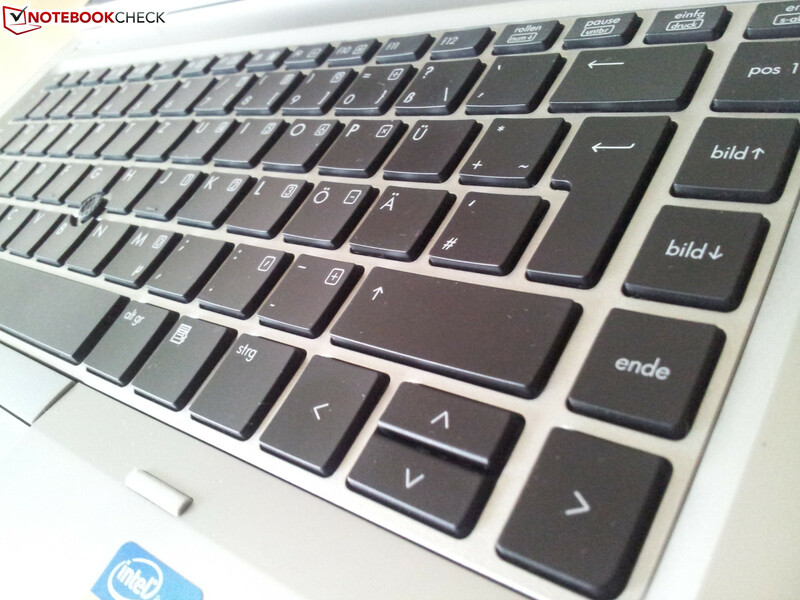 The keyboard in chiclet design makes a good impression and doesn't make any annoying noises with energetic typing. Another good thing is the pressure resistance of the keyboard, which doesn't give in even when dealing with heavy individual keystrokes. 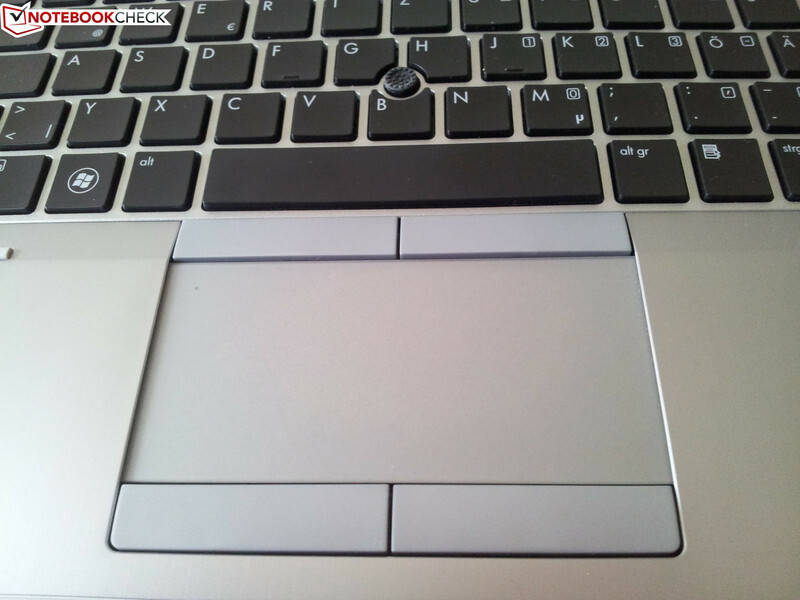 As with the keyboard, the touchpad can also score points. The mouse replacement has been inserted into the palm rests and is thus a bit lower. 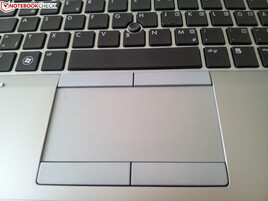 The two mouse buttons are found both above and below the touchpad, with the top set of mouse buttons being intended for use with the integrated Pointstick. Of the two alternatives for controlling the mouse pointer, we prefer using the touchpad, since the control of if it seems to be a lot easier and accurate. The size of the touchpad is very generous and also the surface finish doesn't leave room for complaint - very smooth and very easy to glide over. The mouse keys are covered with a rubberized surface. This is designed to make them work quietly, without the all-too-familiar click as acoustic feedback. As is often the case with most modern notebooks, the installed touchpad on the EliteBook 8470p can recognize various gestures, eg. zooming or rotating pictures through two finger gestures. In order to meet the needs of professional business customers, HP equips the 14-inch EliteBook 8470p with a HD+ display with LED back lighting and a display diagonal measurement of 35.6 cm. The maximum resolution of 1600x900 pixels is an added value for a 14-inch device and makes working simultaneously with two windows easier. The display brightness has been improved in comparison with the predecessor. What used to be an average brightness of 195.3 cd/m² is now up to 256.7 cd/m², a positive development that outdoor use will benefit from. As long as the device is not put in direct sunlight, you shouldn't have any problems using the notebook outdoors. The weaknesses of the display are the high black level score of 1.4 cd/m² and the correspondingly low contrast ratio of 191.1, which we have already criticized with the EliteBook 8460p. A slightly higher contrast rich display would not go amiss with the office workers, especially with the price level that the EliteBook 8470p is at. A look at another model shows that the manufacturer HP can do better. With a black level of 0.42 cd/m² and a good contrast ratio of 631:1, the display of the big brother model EliteBook 8570p was given a rating of 88% by us - and rightly so. 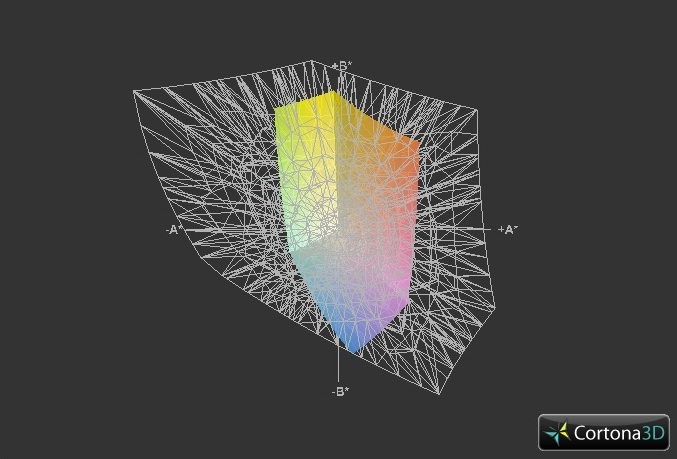 You should hardly notice the contrast limitations while working or playing videos. One big difference comes with dark movies scenes, where you will clearly see a grayer looking scene. 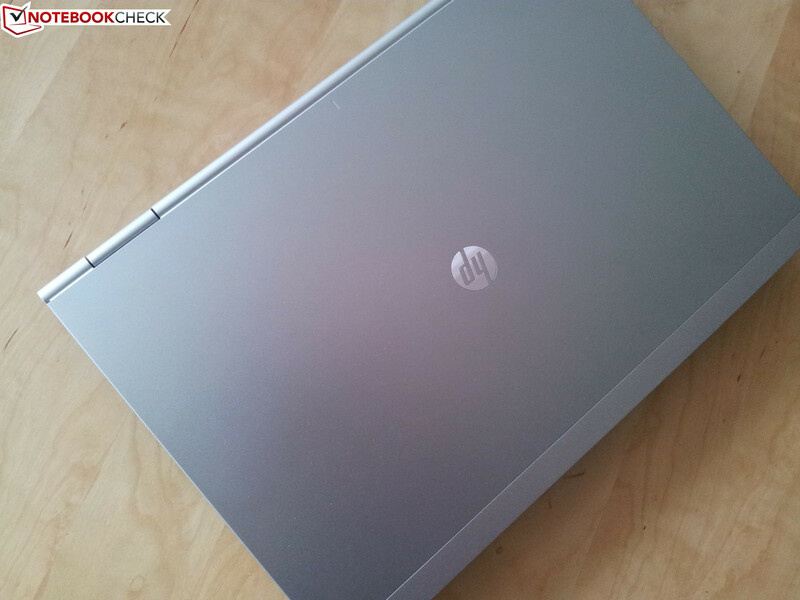 The HP EliteBook 8470p is a work device for the office and while on the move. Image editing with professional standards is not a strength our test model possesses. For this task, the color space of the display is too small, which you can see when compared with the sRGB color space. The comparison with the bigger Adobe color space does however get a bit worse. 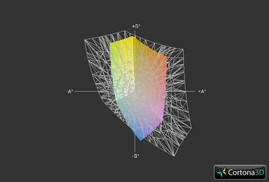 In everyday business work or playing multimedia data the color space weakness of the display is irrelevant. 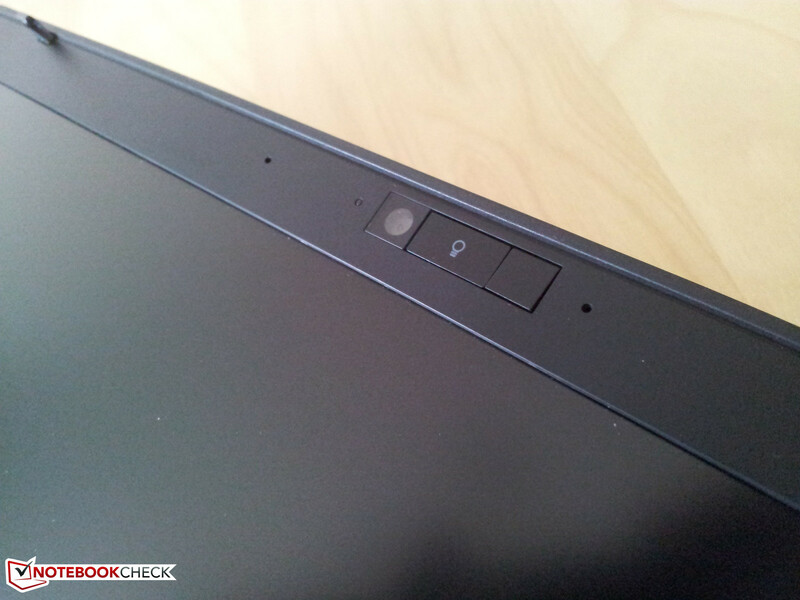 The previous model showed a clear weakness when it came to viewing angles. 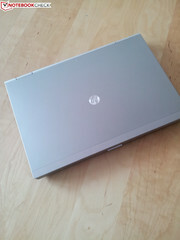 This contributed to the EliteBook 8460p closely missing out on a rating of very good. It also meant there was a bit more worry about how the EliteBook 8470p would do here. Unfortunately, the new model seems to show the same weaknesses. The vertical viewing angle is especially limited and quickly results in contrast changes and darker images. The horizontal angle is also responsive to changes of the opening angle and the sitting position; however, it is a fair enough behavior and you can still recognize things on the screen even with a somewhat flat viewing angle. 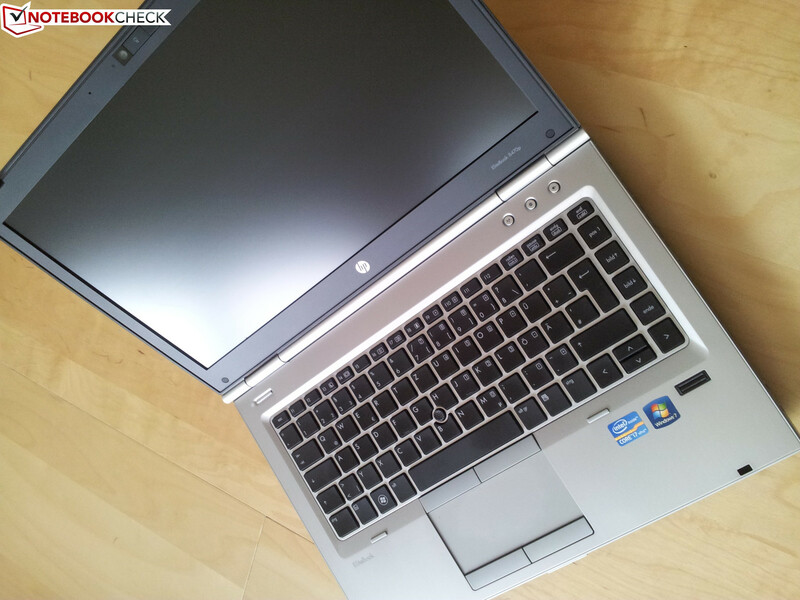 It has been over a year since we tested the EliteBook 8460p. The dual core Core i7-2620M, which has a base clock speed of 2.7 GHz and is based on the Sandy Bridge architecture, has already shown us good application performance. However, we have to consider the graphics solution as a mixed blessing, since the cooling system wasn't good enough to provide fresh air to the GPU and CPU while under full load - CPU throttling was the disappointing consequence. So how does it look with the new model? 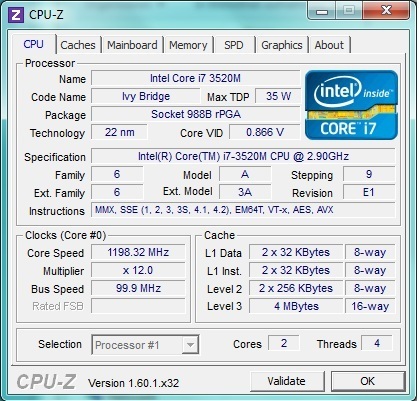 The installed Intel Core i7-3520M is a dual core and works with a base clock speed of 2.9 GHz. 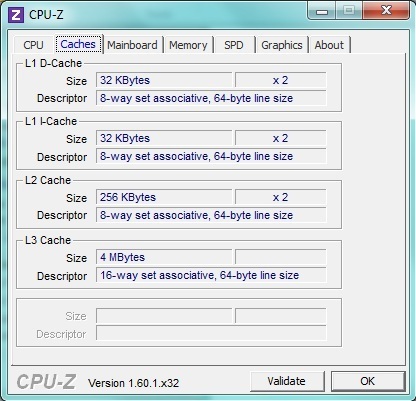 With help from Hyperthreading the two cores can process up to 4 threads simultaneously. 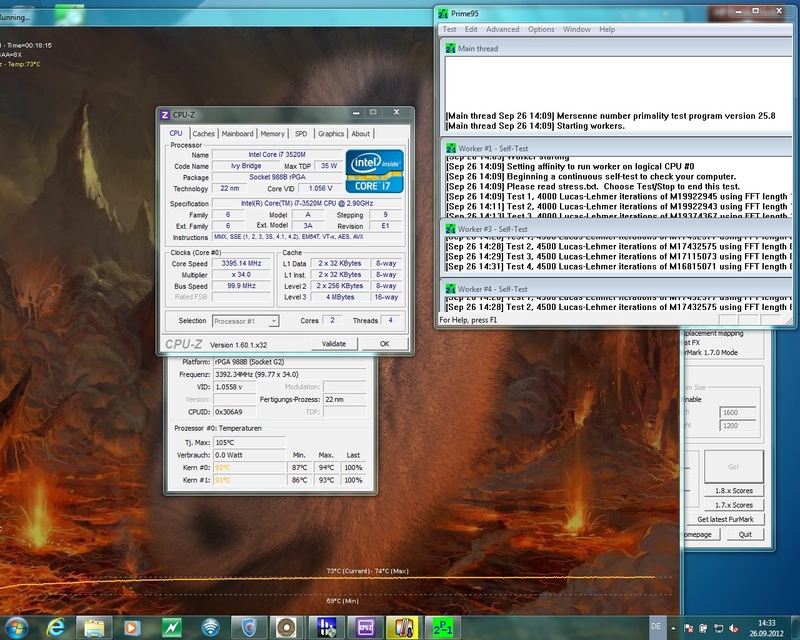 Thanks to Turbo Boost, a theoretical overclocked speed of up to 3.6 GHz is possible. In practice, our test model reaches up to 3.4 GHz, regardless of whether just one or both cores are being used. The performance of the Core i7-3520M CPU meets our expectations, well shown by the comparison of the CineBench10 results. With a score of 10,446 points in CineBench10 multi-rendering (32 bit) the EliteBook 8470P finds itself between the Lenovo ThinkPad T430 (10,251 points) and the HP EliteBook 8570p-B6Q03EA-ABD with 10,545 points - both of the other comparison devices are equipped with a Core i7-3520M. A comparison with the previous model is also certainly interesting, especially for interested customers who already have an EliteBook 8460p and are considering an upgrade. The performance increase between the devices of different generations is only 8% in this case, which is rather negligible in practice. Depending on what other processor is installed there could of course be a bigger advantage. In a previous paragraph we mentioned the keyword CPU throttling in regards to the EliteBook 8460p. We can now say things are all clear for the 8470p. During the course of our testing we could not find any throttling of the CPU. Even after several hours of torture with Prime95 and Furmark the turbo of 3.4 GHz remained stable - at satisfactory temperatures. 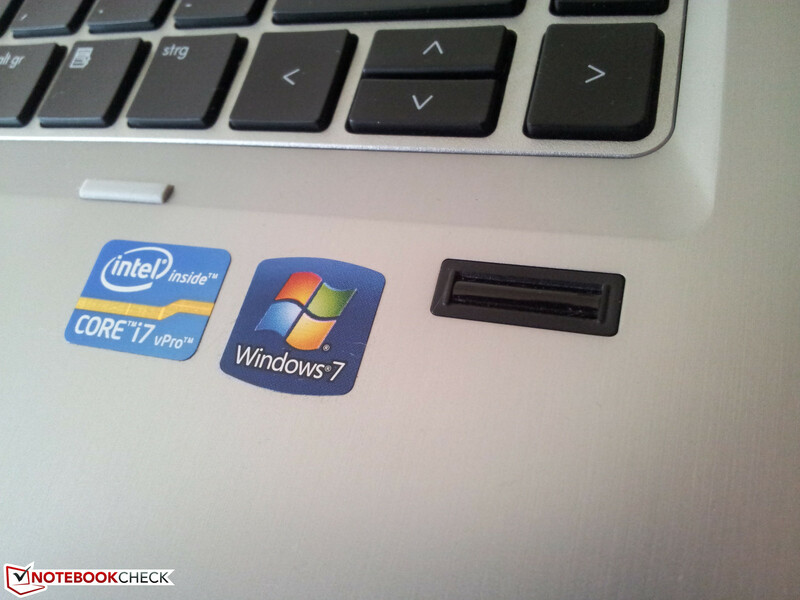 Thanks to the strong CPU the EliteBook 8470p is equipped for lots of applications. Only complex 3D tasks cause trouble for our test candidate. This is because of the weak Radeon HD 7570M. Office tasks, picture editing, video conversion and much more don't create any problems. Next to the graphics card, which slows down the system during demanding 3D tasks, the HDD installed on our test model also lowers overall system performance. 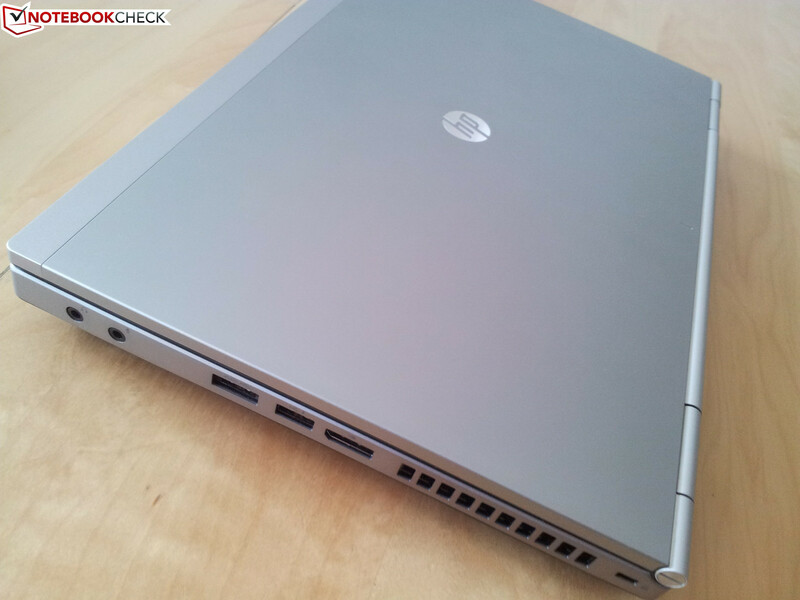 The EliteBook 8470p reached a total score of 8,815 points in PCMark Vantage, wherein the hard drive (HDD) held the lowest value of 4,032 points. This is further concluded through the Windows 7 performance index, which reveals the hard drive to be a bottleneck with 5.9 points - in addition to the RAM. This is also where our EliteBook 8470p has wasted expandable potential, since there is only one 4 GB of DDR3 RAM installed, meaning that there's no dual channel. Naturally you can increase performance with an SSD and RAM in a dual channel mode, but we also can't complain about the performance offered by this configuration of the EliteBook 8470p. The biggest performance increase you will notice will probably come from upgrading to an SSD. One such configuration is offered on the manufacturer's homepage at around 1800 Euros (~$2329), but doing the swap yourself between the built in HDD and an SSD is worth considering. 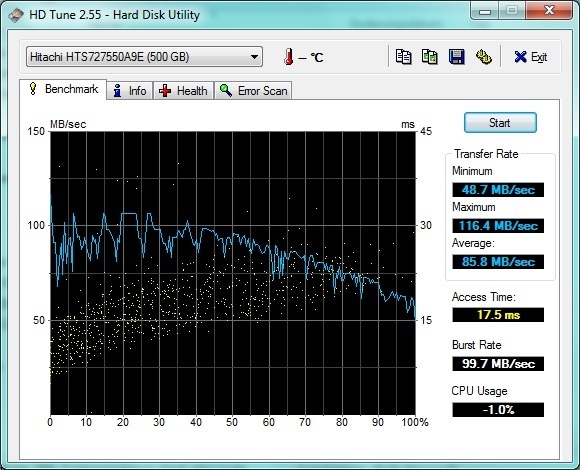 As for storage devices, HP includes a HDD from Hitachi in our test model which works at a speed of 7200 rpm. With an access speed of 17.5 ms, it does well when compared to other 7200 rpm HDDs. The transfer speed meets our expectations and reaches the same level as the EliteBook 8570p which is equipped with the same HDD. 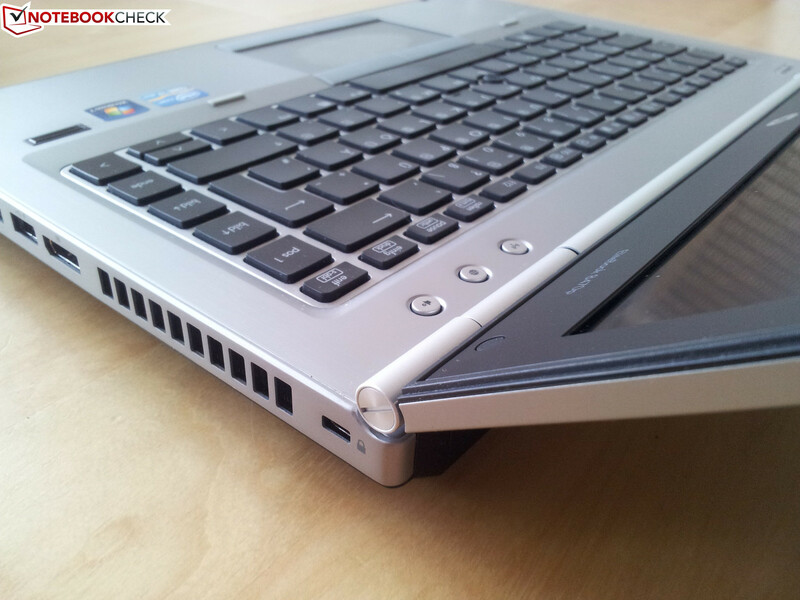 In the configuration that we have been given, the EliteBook 8470p is equipped with a middle class graphics card from AMD. 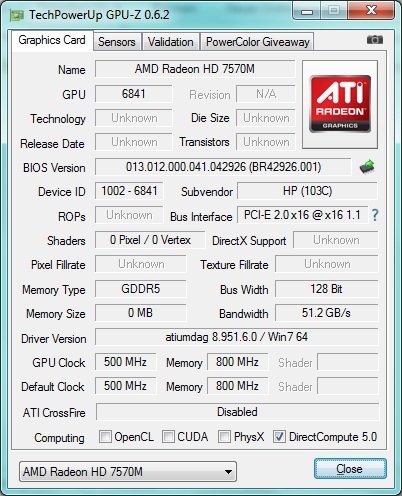 The Radeon HD 7570M is classified as a DirectX11 GPU and is based on the same chip as the Radeon HD 6630M. 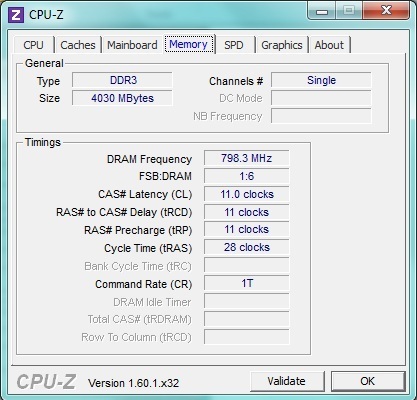 It can be used with both DDR3 and GDDR5 memory modules; however, the connection with only 64 bit is limited. Naturally an Intel HD 4000 Graphics is included in the CPU, however, buyers of the EliteBook 8470p with dedicated graphics cards will have to go without the energy saving GPU. 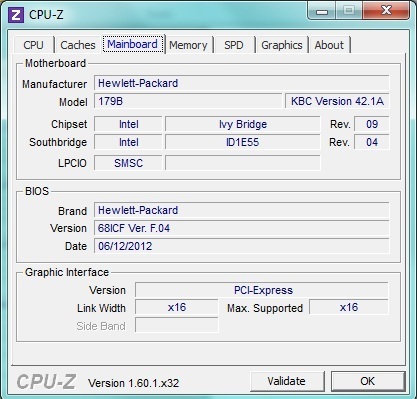 Neither in the settings options of the Catalyst Control Center nor in the BIOS is there an option to activate or even select the Intel HD 4000 Graphics. The Radeon HD 7570m has a power advantage of about 25% over the Intel HD 4000, despite still being 10-20% behind the performance of an Nvidia GT 630M. 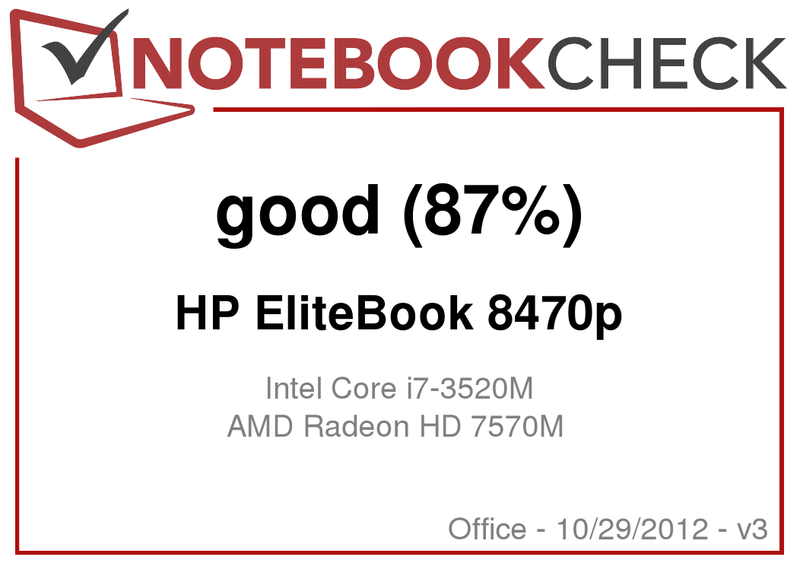 With an upgrade from an AMD Radeon HD 6470M to a Radeon HD 7570M the graphics performance of the EliteBook 8470p is clearly above that of the previous model EliteBook 8460p. Comparing the 3DMark06 (6,108 to 3,674 points) and 3DMark11 (953 to 595 points) benchmark scores shows a clear increase of GPU power by 66% and 60% respectively. These numbers sure sound good, but in practice things seem different. In our conversion test AMD's Stream, Intel's Quick Sync and also Nvidia's CUDA lag behind with QuickTime videos, but you can expect higher performance with WMV format videos. With the focus pinned on making a work device, the gaming performance of the notebook is naturally a secondary issue. 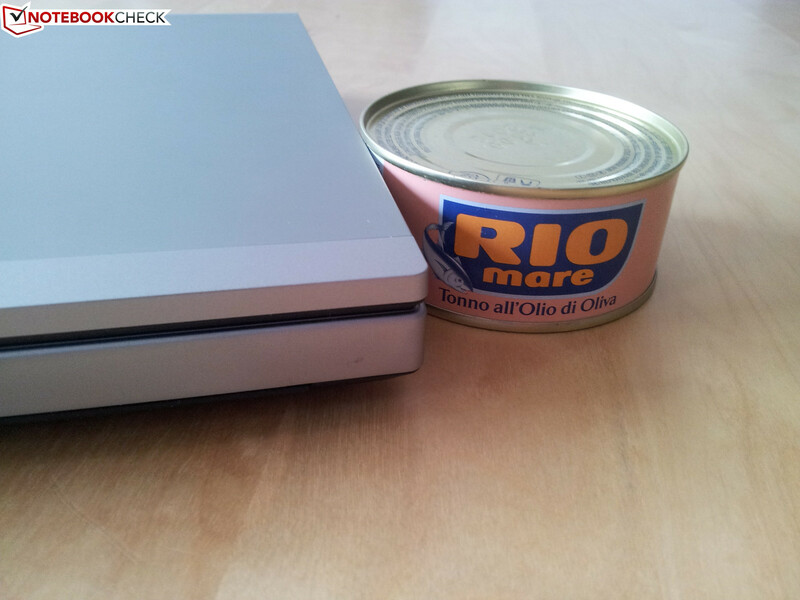 Nevertheless, we test some current games. We conducted practical tests with WoW, Diablo 3 and Anno 2070. A smooth gaming experience with a high resolution and high detail is only manageable with WoW. In Diablo 3 and Anno 2070 gaming is only possible in minimal to mid range settings. At higher detail settings the Radeon HD 7570M is already at its limits and is not able to guarantee smooth gameplay over the 30 fps mark. 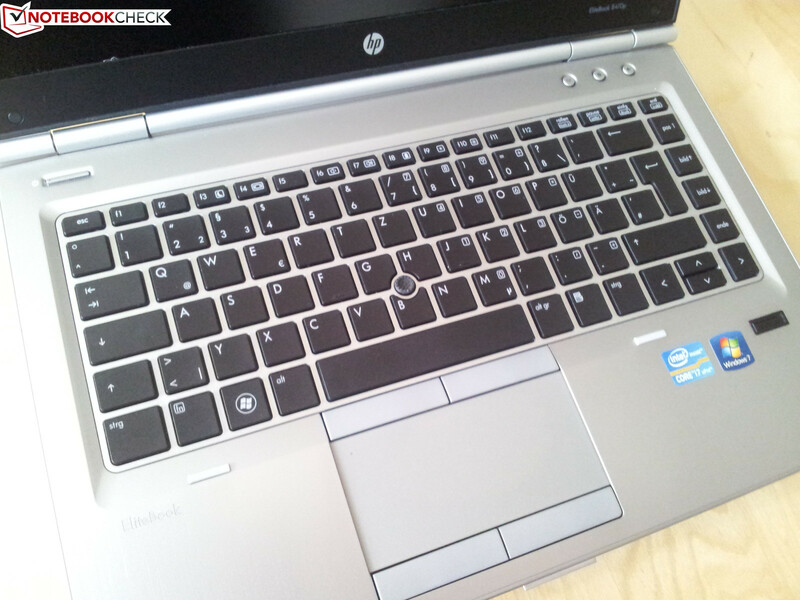 For more info on the gaming capability we refer to the review of the HP EliteBook 8570p which has identical hardware in a 15-inch case. The volume of our test model in idle mode constantly stays in the background with 32.2 dB(A), whereby the fan is not completely shut off. Luckily, the fan works at a pleasant frequency range, which we did not find annoying or intrusive. The optical drive, in contrast, is much louder to work with. With 37 dB(A) it is clearly audible and sometimes louder than the HP EliteBook 8470p under stress. With an average volume of 35 dB(A) while under load, our test device is good and relatively quiet. In regards to heat we can give the EliteBook 8470p a good testimony. The measured values in idle mode are all in the green zone with temperatures on the top side all under the 30 °C mark. Aside from one exception of 31.6 °C in the middle on the right hand side, the temperatures on the bottom also don't exceed 30 °C. The test model can also keep a cool head on the top side even while under load. The temperature values are only a few degrees more than in idle mode. The maximum value is 38.2 °C and found around the fan vent. On the bottom side is where we find the overall highest temperature of 46 °C. The other areas are more than okay and don't leave any reason for complaints. We could not find any instances of an underclocking of the CPU due to excessive operating temperatures (aka throttling). 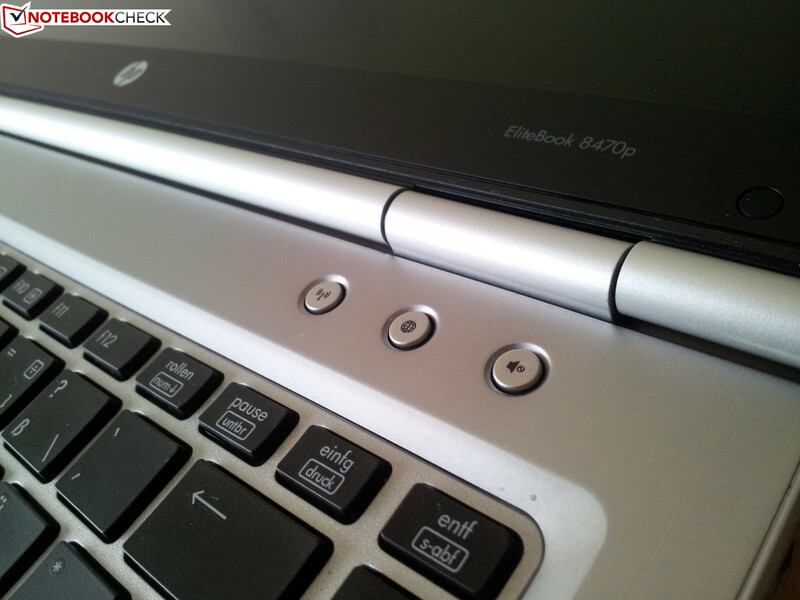 The HP EliteBook 8470p has two stereo speakers which are found at the front area on the under side. As with most (business) notebooks, our test model has acoustic weaknesses. However, the maximum volume of the speakers is good enough for everyday use without having to overload the speakers. Anyone wanting more sound out of the EliteBook 8470p should connect the notebook to stereo speakers or invest in high quality headphones to overcome this weakness. Because of the potent hardware the energy needs have increased since the previous model. If you compare the values of both devices, the average difference is 4.3 Watts - not an extremely bad increase of 30%, but will naturally affect the following run time test negatively. Under load the consumption is between 41.3 and 68.8 Watts depending on the application. A comparison of this result is sadly not possible here, since the EliteBook 8460p was struggling with GPU throttling at that time, meaning that our measurements in regards to usage and performance while under load were not carried out properly. One important factor for a mobile work device has to be the battery life. Nothing is more annoying than your notebook running out of juice during an important presentation, or having to ask for a charger at an out-of-town appointment with a client. 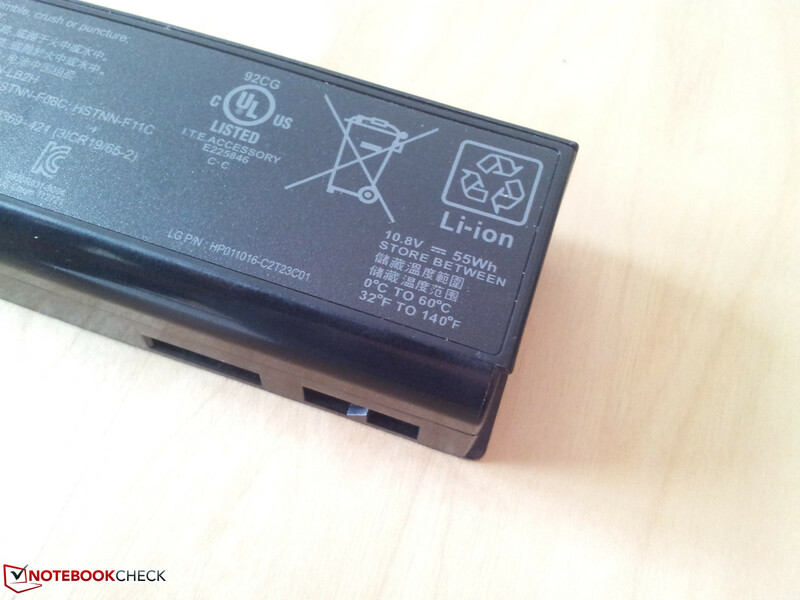 To measure the maximum as well as the minimum battery life time, we turn to the long running BatteryEater tool. With the Reader's and the Classic tests we were able to measure possible running times of at least 66 minutes under load (Classic) and a maximum of 256 minutes (Reader). The values are somewhat disappointing, but without a switchable graphics solution this is plausible. While surfing via WLAN the EliteBook 8470p manages roughly 208 minutes (3 and a half hours) with a fully charged 6-cell battery. With DVD playback the battery lasts a little less than three hours. Compared with the values of the predecessor model 8460p, the run times are rather sobering, although not particularly surprising. 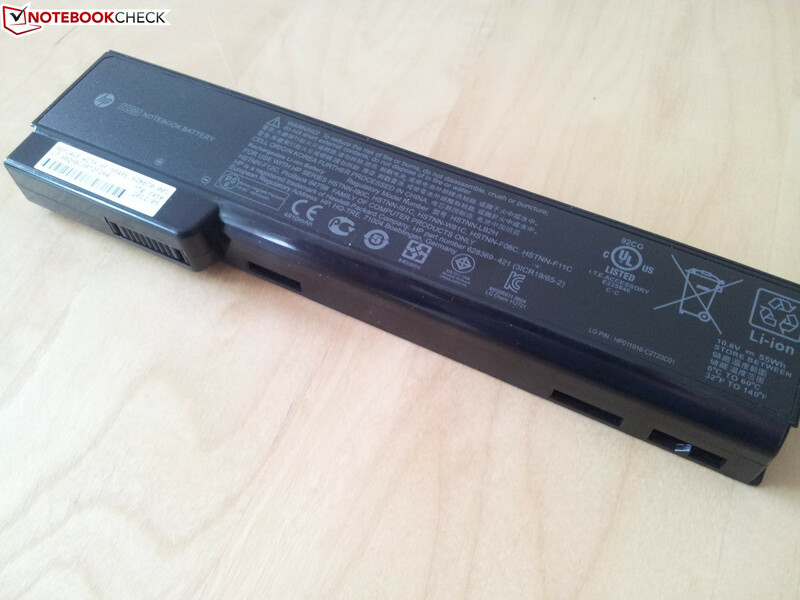 Equipped with the same battery (6-cell lithium ion battery with 55 Wh) already used in the EliteBook 8460p and combined with the increased energy demands of the more potent hardware, the shortened battery life was expected. Even if the mobile run time falls short of the predecessor model, the results are still on the acceptable level and are still reasonable enough to work with. When on the hunt for a business notebook that reaches high demands, sooner or later you will certainly find yourself looking at the HP EliteBooks. 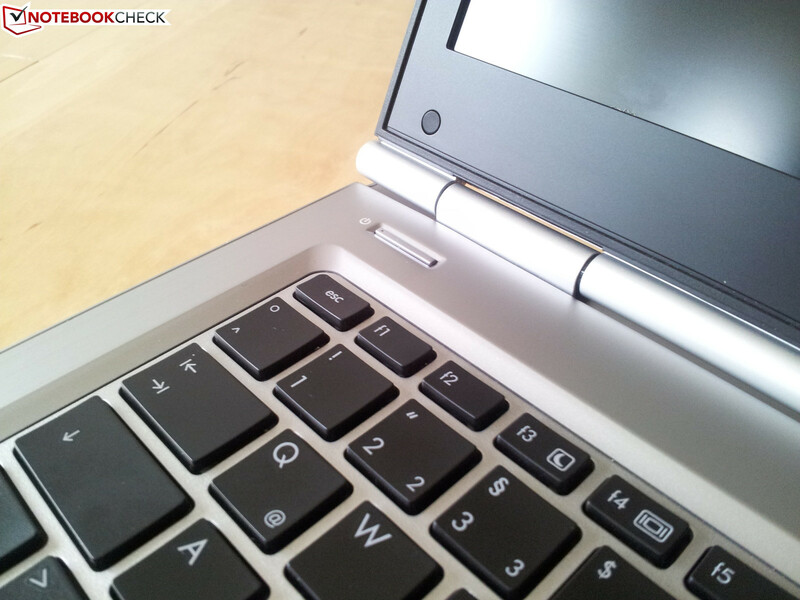 The EliteBook 8470p is a representative of the 14-inch segment and builds on the success of the previous 8460p. The manufacturer sticks with the known strengths of the predecessor, such as the robust and rigid aluminum case and the very good input devices. The excellent variety of ports and the good computing as well as overall performance are also very convincing. Unfortunately, such 'porting' translates the weaknesses onto the next generation. 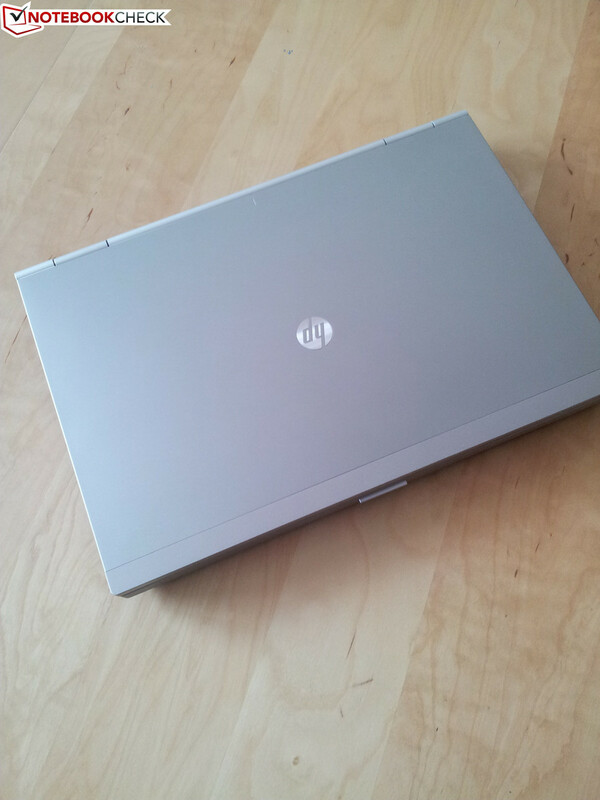 Once again, the EliteBook 8470p presents a very chunky look. 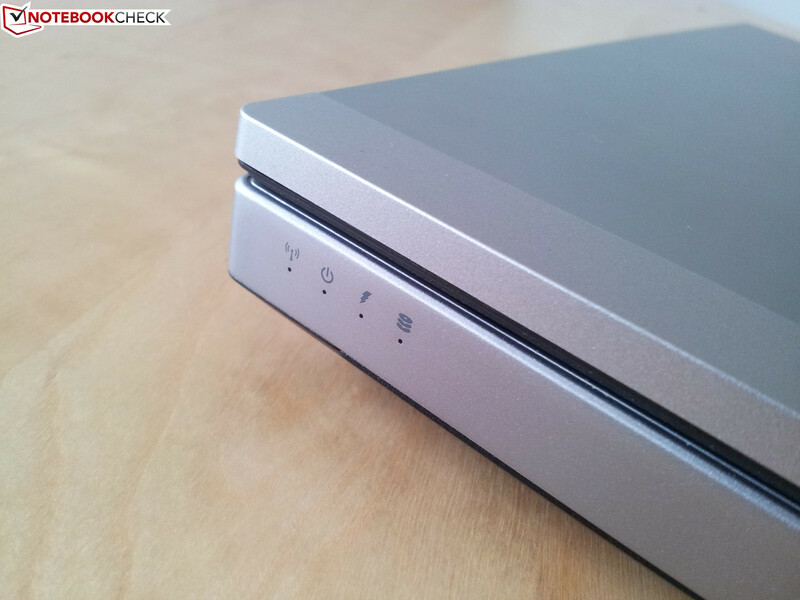 With a thickness of about 3.5 cm the device is a bulky example from the notebook market. 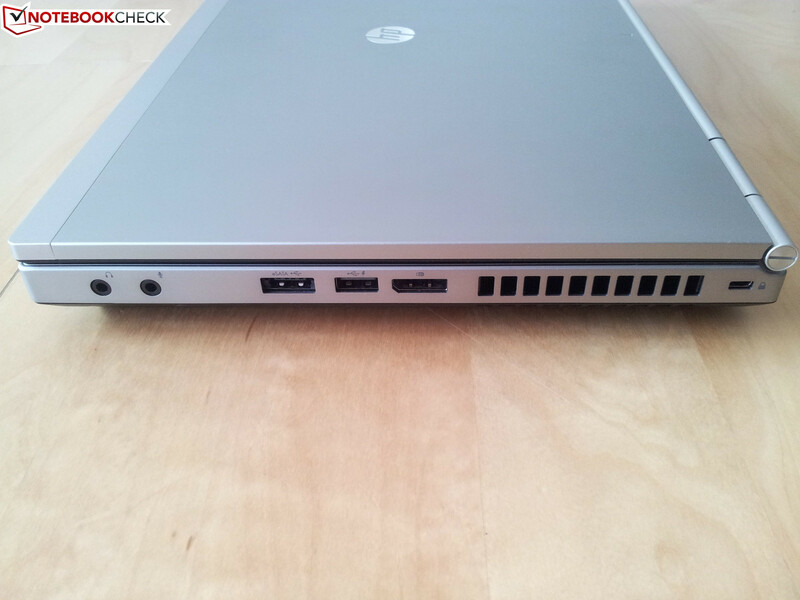 As it should be with a business device, HP offers the EliteBook 8470p with various security tools and features. Both hardware based and software based security measures have been thought through. For most things you will not have to pay, but with Computrace you will be asked for money. 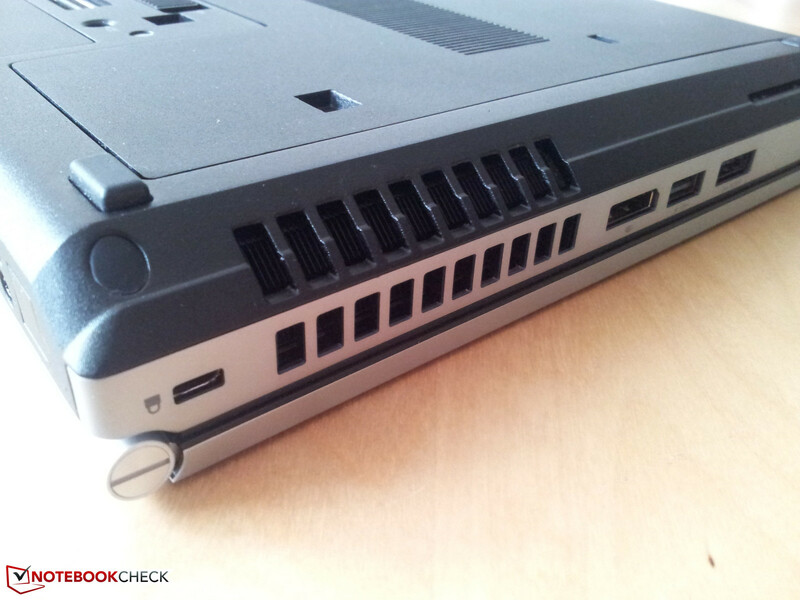 One blunder from HP comes from the inbuilt graphics card without switchable graphics. The installed AMD HD 7570M can only separate itself slightly in terms of power from the alternative Intel HD Graphics 4000, and possesses disadvantages of increased energy consumption and the following decreased battery life. Overall, HP has been able to once again score well in many areas and, as with last time, has a good product on their hands. We have to advise against an upgrade for people with the predecessor model, since the increased power is disproportionate to the quite high cost. With a purchase price of around 1300 Euros (~$1682) up to the deluxe model at over 2000 Euros (~$2588), there should be an EliteBook 8470p configuration for everybody. The speakers are found on the bottom side. LEDs show the status of the device. Even the hinges leave a good impression. The touchpad and mouse keys are convincing. 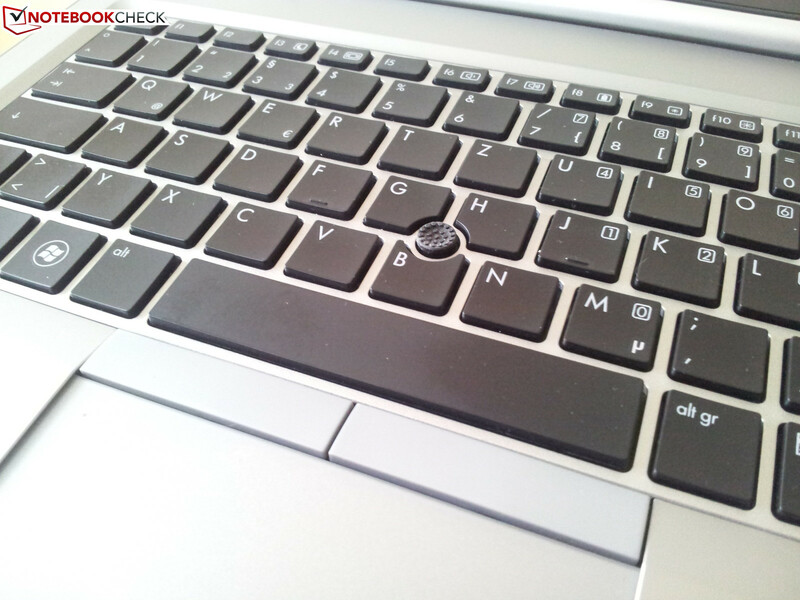 The cursor keys in compressed form. 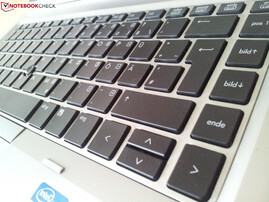 The keyboard in chiclet design. ...and leave nothing to be desired. The EliteBooks have gotten big, fast. The lack of a switchable GPU solution. Lenovo ThinkPad T430, same CPU and stronger GPU. 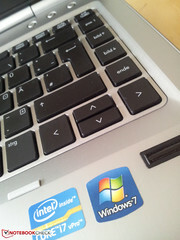 Dell Latitude E6430.